A botched execution using a disputed new drug combination left an Oklahoma inmate writhing and clenching his teeth on the gurney on Tuesday, leading prison officials to halt the proceedings before the inmate's eventual death from a heart attack. Clayton Lockett, 38, was declared unconscious 10 minutes after the first of the state's new three-drug combination was administered. Three minutes later, though, he began breathing heavily, writhing on the gurney, clenching his teeth and straining to lift his head off the pillow. The blinds were eventually lowered to prevent those in the viewing gallery from watching what was happening in the death chamber, and the state's top prison official eventually called a halt to the proceedings, although it didn't save Lockett. "They should have anticipated possible problems with an untried execution protocol. Obviously the whole thing was gummed up and botched from beginning to end. Halting the execution obviously did Lockett no good," Autry said. Republican Gov. Mary Fallin ordered a 14-day stay of execution for another inmate who was scheduled to die two hours after Lockett, Charles Warner. She also ordered the Department of Corrections to conduct a "full review of Oklahoma's execution procedures to determine what happened and why during this evening's execution." Lockett's botched execution is sure to fuel the debate over the death penalty in the U.S., where several states have had to scramble to find new sources of execution drugs because drug makers that oppose capital punishment — many based in Europe — stopped selling to prisons and corrections departments. Several states have gone to court to shield the identities of the new sources of their execution drugs. 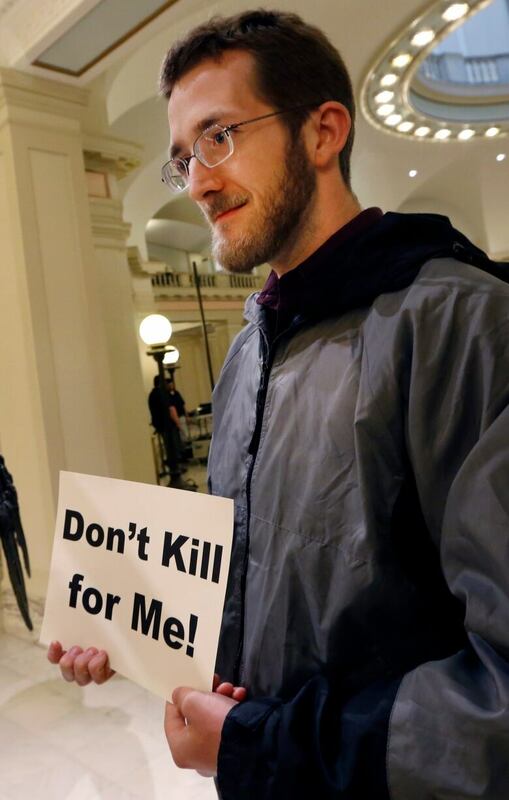 Missouri and Texas, like Oklahoma, have both refused to reveal their sources, but both of those states have already successfully carried out executions with their new supplies. Robert Patton, the director of the Department of Corrections, halted Lockett's execution about 20 minutes after the first drug was administered, saying later there had been vein failure. About three minutes later, though, Lockett began breathing heavily, writhing on the gurney, clenching his teeth and straining to lift his head off the pillow. After about three minutes, a doctor lifted the sheet that was covering Lockett to examine the injection site. After that, an official who was inside the death chamber lowered the blinds, preventing those in the viewing room from seeing what was happening. Patton then made a series of phone calls before calling a halt to the execution. Autry questioned the amount of the sedative midazolam that was given to Lockett, saying he thought that the 100 milligrams called for in the state's execution protocol was "an overdose quantity." He also was skeptical of the department's determination that Lockett's vein failed. "I'm not a medical professional, but Mr. Lockett was not someone who had compromised veins. He was in very good shape. He had large arms and very prominent veins," Autry said. It was the first time Oklahoma administered midazolam as the first drug in its execution drug combination, but other states have used it. Florida administers 500 milligrams of midazolam as part of its three-drug combination. A four-time felon, Lockett, 38, was convicted of shooting 19-year-old Stephanie Neiman with a sawed-off shotgun and watching as two accomplices buried her alive in rural Kay County in 1999 after Neiman and a friend arrived at a home the men were robbing. By then, Gov. Mary Fallin had weighed into the matter by issuing a stay of execution of her own — a one-week delay in Lockett's execution that resulted in both men being scheduled to die on the same day.